This is a recipe from the good people at Fine Cooking. It arrived in my email box a couple of days after I’d made turkey stock so I thought I’d adapt and give it a try. It was quite delicious. I have never been disappointed with a recipe from Fine Cooking. 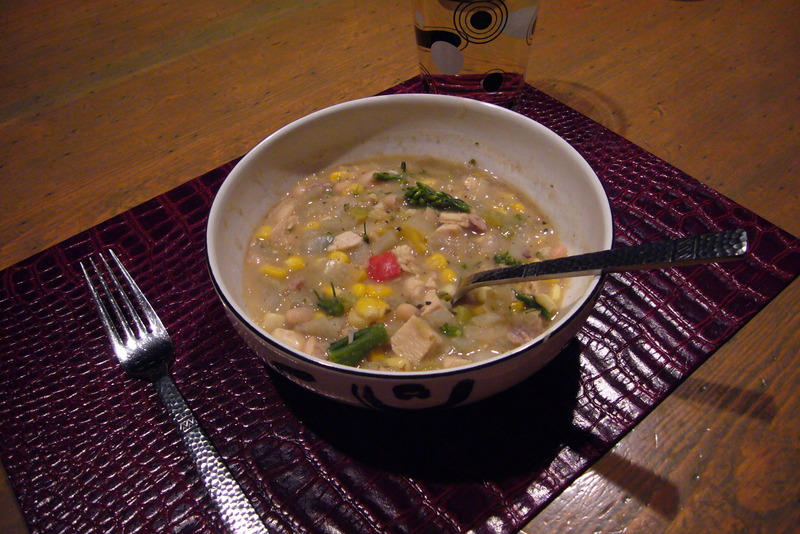 I used home-made turkey broth, leftover roasted turkey and added some chopped cooked broccoli and red pepper. Perhaps I forgot to mention that I scored turkey carcasses from two Thanksgiving dinners. I am so lucky to have good friends. Heat the oil over medium-high heat in a 5- to 6-quart Dutch oven. Add the onion and cook, stirring, until tender, 4 to 5 minutes. Add the cumin, oregano, and garlic and cook until fragrant, about 1 minute longer. Stir in the chicken and chiles and then add the broth and 1 can of beans. Bring to a simmer. Reduce the heat to low and simmer, partly covered and stirring occasionally, until the flavors blend, about 20 minutes. Meanwhile, purée the remaining can of beans in a food processor. Stir the puréed beans into the chicken mixture along with the corn. Continue to simmer to blend the flavors, about 5 minutes longer. Ladle into bowls and serve.